As I prepare to head out for Mass this morning, John Vennari and his loved ones are on my mind. Please remember to ask the Lord to grant John “a place of refreshing coolness, light, and peace” today, and to provide abundant comfort and unending hope in the Resurrection for his beautiful family. In thinking of John, I recalled a couple of “interviews” we did together in 2014 at the Fatima Conference in Ontario. I’m posting the videos below in case those who haven’t seen them would like to take a look. I knew very well as he and I sat down together that I was on the receiving end of a great privilege. Looking back even now, I still cannot help but marvel at how good God is to dispense such unmerited gifts. 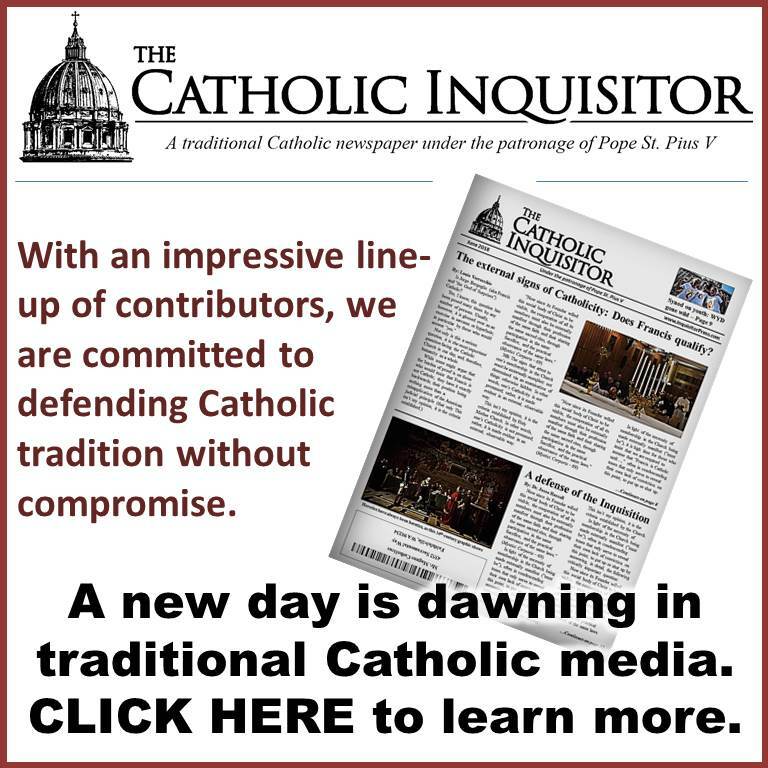 Does Vatican II qualify for an imprimatur? 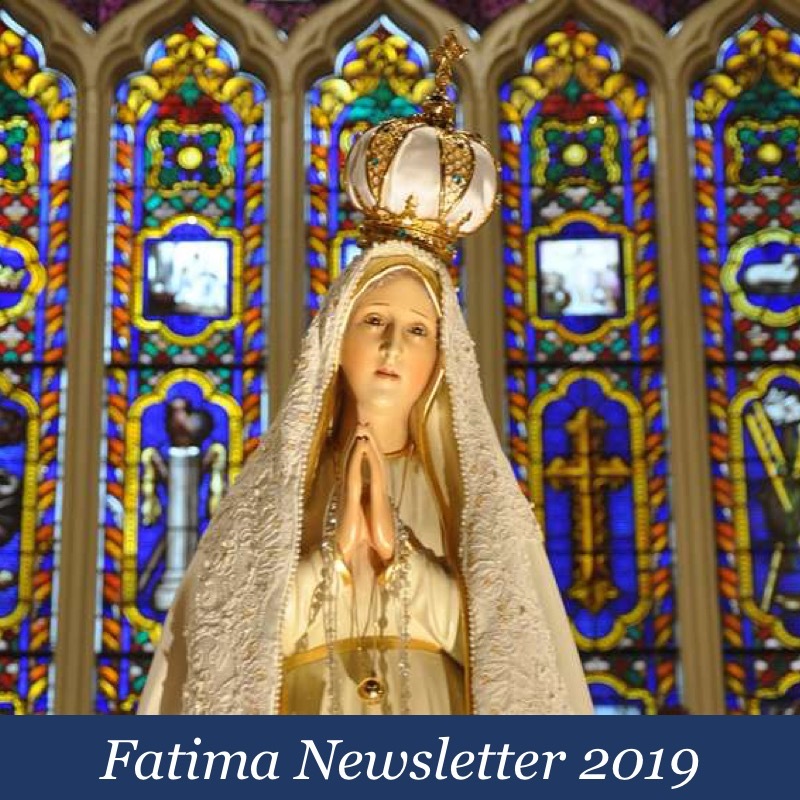 Those who are familiar with John Vennari through the Catholic Family News and his website recognize John’s dedication and brilliance in defending Our Lord’s Church and the true message of Fatima. Those who know him more personally by attending his conferences and other live events are very aware of his love and devotion to his loving wife, Susan, and three adoring children. Thank you, Louie, for this tribute and reminding us to keep John and his family in our prayers. May John rest in eternal peace. Our Lady of Fatima, intercede for the comfort and consolation of John’s family. Thank you for this, at once seeing John again doing what he do so well with conviction and humility, this side the veil, and for reminding us, vis a vis “Quas Primas”, just Who our Blessed Dominus Deus Sabbaoth and Savior, Jesus the Christ Is. As He Is into eternity, the King of all that is as He created it, and as He founded His Church, One, Holy, Catholic, and Apostolic, for the singular purpose of the salvation of the souls of His human persons, and as He established His Vicar in the Chair of Saint Peter, it can only be concluded by virtue of right reason, that this novus ordo creature beast thing, so called “new church” or “VC II church”, simply is not Catholic. To suggest otherwise is to existentially manifest a direct and specific embrace in contradistinction, or as otherwise stated, to place an utter affront, to the Law of Non-contradiction. As you well know, this law states that “being cannot both be and not be at the same time and under the same respect”. In his Summa Theologiae, the Angelic Doctor informed us that the singular way in which we can rightly reason is exclusively by virtue of our participation in the Mind of God. If we look to the law of non-contradiction and focus on the part which says, “…and under the same respect”, we have to ask, as it pertains to “new church” versus the Church that the Son of God made Man Himself established in Apostolic succession, One, Holy, Catholic, and Apostolic, precisely just what is the “respect” addressed in the question of which church is authentically Catholic? Intuitive sense dictates that “new church” and the “Catholic Church” are distinct entities, existing not only apart from one another but existing in contradistinction, frankly existing in direct and utter opposition. In “respect” to the authentic Catholic Church, we have two millennia of Magisterial teachings, founded in divine Revelation and Holy Tradition, guided by true Vicars of Christ. In respect to “new church”, we have the Second Vatican Council and anti-Popes as its vicar. In “respect” to authentic Truth as Truth Himself, we rest with the 2,000 years of Magisterial teaching as the only Church of Jesus the Christ. Two “beings” in opposition cannot be the same “being”, as that defies the law of non-contradiction. “New church” versus the “One, Holy, Catholic, and Apostolic Church”; one is founded by Christ Jesus, the other by Lucifer vis a vis his preternatural gifts given from his mind to the minds of his useful idiots who constructed and continue to evolve, “new church”. This “new church” simply is not as it cannot be, simply the creation of man from his immanence, rather it is the distortion of Reality under the preternatural guidance of the Prince of this world, who was given all the kingdoms of this world and the freedom to give them to whoever he chooses. “New church” has Lucifer’s signature all over it with its eloquent syncretic construction from the documents of the false ecumenical council of Vatican II. Just as two “beings” as “new church” and the Catholic Church cannot both be and not be at the same time and under the same respect– both “Catholic”– as they cannot either both be “not Catholic”, one is authentically Catholic and one is not. The same right reason applies to the Vicar of Christ. 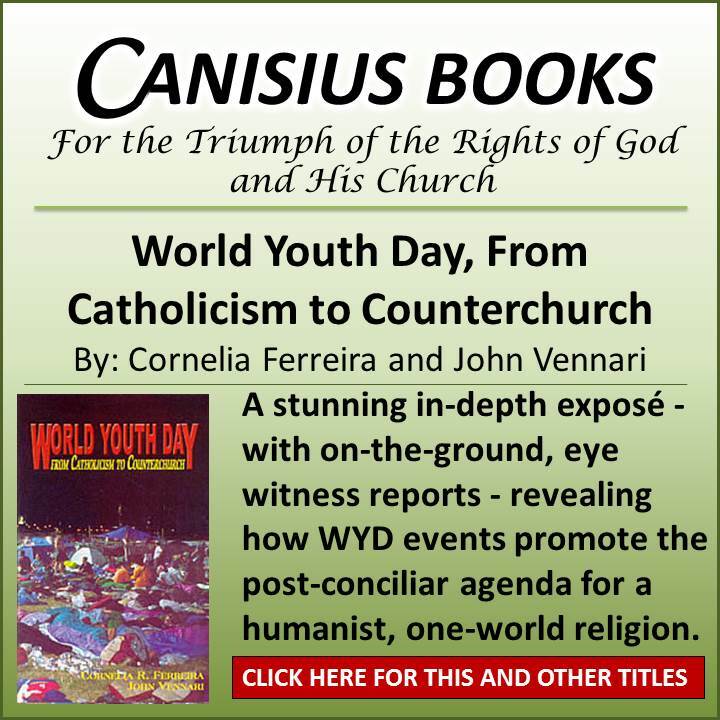 The Vicar of Christ who presides over the Catholic Church as its faithful Monarch in the Chair of Saint Peter, cannot preside over both “new church” and the Catholic Church as that once again, that places an affront to the law of non-contradiction. The Pope who rests in the succession of Saint Peter cannot be the vicar of a church which blatantly contradicts the teaching of the Son of God Himself. In conclusion, right reason using the metaphysical teachings of the Angelic Doctor, simply dictates that we have in our midst and have since 1958 with the “election” of Roncalli as “John XXIII”, including all of the “popes” since that time, and including Bergoglio as “Francis”, two distinct churches. One Church is the Church that the Son of God as God Himself established for the singular purpose of the salvation of the souls of all His human persons and that is the authentic Catholic Church whose See has been vacant for the past 59 years. The other is the church of Satan, the anti-Church, which preaches the anti-Gospel, all for the purpose of invoking the Great Apostasy, which we now find ourselves in the midst of for the past 59 years. This Great Apostasy has yielded from its very immanent design in the mind of Lucifer, the greatest deception that has ever befallen mankind. This deception has placed, in all but perfect juxtaposition, the One True Church founded by Jesus the Christ, and the anti-Church founded by Lucifer. They exist in parallel but in an INVERTED parallel, therefore in perfect opposition, one leading souls to Heaven and the other leading souls to Hell. This kind of deception can only find its wellspring in the Great Deceiver himself, who could only have used the One, Holy, Catholic, and Apostolic Church as his foundation for building this novus ordo, creature beast, church, which exists as manifest evil incarnate in time and space. The great mystery is how our Lord and our God has allowed this all to happen, particularly in the understanding of leaving the See of Peter vacant for the past 59 years. One thing we know with certitude is that more souls will be saved as a result of this looming cataclysmic calamity than were being saved otherwise. It would seem that the person of the anti-Christ is in our midst. May Almighty God shower us with His mercy. Finally, find now some critical promises from Our Lady of Akita, which brings light unto what has been reasoned in this brief essay. •	The Church will be in eclipse, the world will be in dismay. Dear In Caritas….Thankyou for your masterful explanation, if you are a priest how blessed is your parish, if you are a teacher how blessed are your students. “It is primarily the priest’s obligation to lead us in the battle to defend the Faith. Saint Thomas Aquinas did not leave it to the laity to combat the Manichees. St. Francis de Sales did not leave it the laity to combat Protestantism. We laity have our part, but it belongs to the nature of the priesthood to publicly defend the Faith. You were blessed to know John Vennari. I never had the privilege but I take comfort that we now have an advocate before Almighty God and than now John knows that eternal peace is his. I still find it hard to really beleive he has been taken from us during this awful crisis and battle within the Church. I so admired John Vennari and miss him very much. I will keep him in my prayers. Great man and teacher of the Faith. I was told that he held sedevantism position before, anyone knows where I can find his writings on Sedevacantism? Our parish have it as subject of discussion next month. May your devout father rest in peace, evennari. He taught me and my home schooling family so much about the truths of our Catholic Faith. We have just read his booklet “The Revelations of the Holy Face of Jesus.” It is magnificent in its truth. How amazing that this was one of your father’s final works! May God bless and comfort your family in this great loss. Thank you, Louie. You two guys make it all so crystal clear. God is simply Lord of all and everyone! There are a lot of new comers here, thanks be to God, who rely on men like you, today, to keep us aligned to the Truth, as we are just having that blinding Vatican 2, evil veil lifted from our lives. 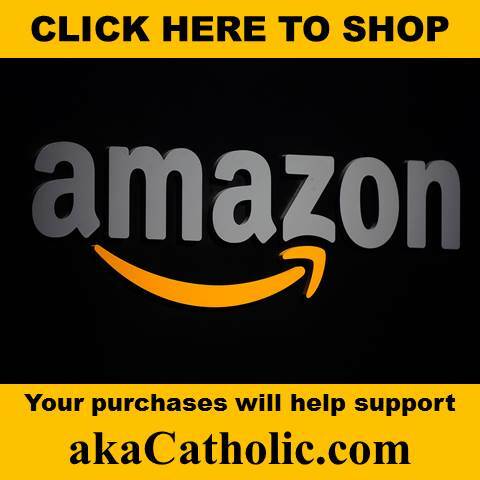 True Catholic support is essential for us. Through your words we are so often relieved. Louie, we are blessed to have you to strengthen and inspire us to persevere in our faith here in this vale of tears. God Bless you, Louie. Keep that Catholic torch burning. What a beautiful tribute, Louie. Thank you. John Vennari had a gift of speaking the expansive truth precisely. He seemed to me to have a mastery of words and thoughts. He was at the same time brief and comprehensive. I guess that is the language of the Catholic Church, and he was Her true son.